Jacqui has a background of tertiary study in Fine Art and Zoology Science. Some artistic achievements in her career include holding three solo shows, 'Pacific Girl' 2018, 'The Australian Bush in Abstract' 2015 and 'The Fur Pill' 2010. She has also gained a handful of awards and recognitions including Highly Commended in the Perth Royal Show Art Prize 2015, Finalist in the Albany Art Prize 2014 and winner of under 25s category in the Cossack Annual Art Prize 2002. Jacqui's hobbies include painting in the studio, bush walking, spotlighting for frogs, playing with her dogs and looking after her menagerie of other animals in her home town on the outskirts of Perth, Western Australia. 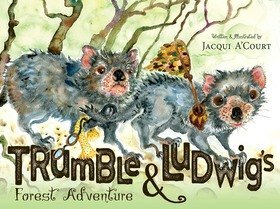 Trumble and Ludwig's Forest Adventures has enabled Jacqui to girdle her passions for both the natural environment and painting, and the driving force (besides a love for painting and writing) was a desire to be more proactive against the plight of some of our vulnerable species! Giving children a fun, light and entertaining education through story, Jacqui hopes to bring about some inspiration and reinforcement of positive attitudes towards our natural environment. Part proceeds from this book are going to the Save the Tasmanian Devil Program, based at the University of Hobart.